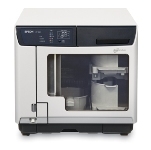 The qd-dvd-125 DVD Duplicator is perfectly suited to organizations that need to deliver small runs on demand or need to have in-house control of their content. 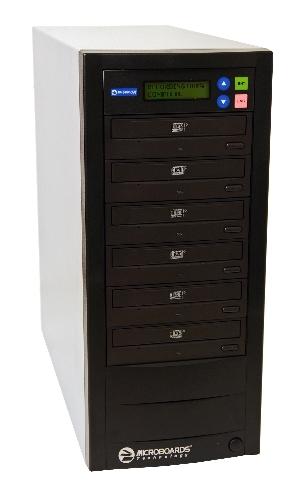 Ease of use and a compact footprint make the qd-dvd-125 DVD Duplicator suited for the front office or practically anywhere in the studio. One button copying gives the user the ability to make three copies at a time at the highest recording speed available. 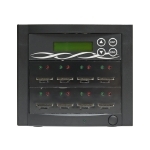 The qd-dvd-125 supports DVD+R and DVD-R, and can copy DVD Video or data. In addition, the qd-dvd-125 supports all of the most popular CD recording formats, including audio, data, and more. 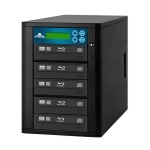 Even dual-layer DVD discs can be copied on this versatile dvd duplicator. The qd-dvd-125 is the latest in a long line of award-winning DVD duplicators from Microboards, and comes complete with a 1-year warranty.